At Neinstein Plastic Surgery we see about 5 patients per week to discuss Coolsculpting revision due to the serious complications from Coolsculpting. Coolsculpting is a heavily marketed device that promises to get rid of fat non surgically. If there was a way of removing fat without actually removing any fat we all would be doing it – but sadly, there is not. In reality, Coolsculpting is painful, unpredictable, expensive, and takes a long time. Patients who come to Neinstein Plastic Surgery for Coolsculpting revisions are generally upset and often feel embarrassed that they spent a lot of time, energy, and money and saw no results. 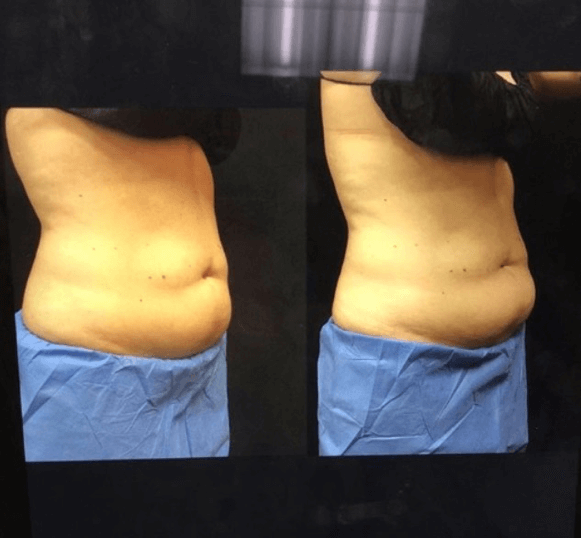 Minimally invasive liposculpting of the abdomen takes 45 minutes with predictable, extraordinary results (as this option actually removes unwanted fat then sculpts and tightens loose skin). Abnormal growth of fat from Coolsculpting (or paradoxical hyperplasia post cryolipolysis) is the biggest risk and concern of all. This Coolsculpting complication often comes up in medical literature but the creator of the device has done a good job of hiding it from the public. Typically, at the 3 month mark Coolsculpting patients begin to notice a growth of fat in the area that was treated. It is not attributed to simple weight gain because the growth only happens in the area it was treated by Coolsculpting. Recently, a patient had a tummy tuck to remove this area. The pathology report showed abnormally large fat cells with thickening of the tissue around the fat and a large amount of abnormal blood vessels. Why this happens nobody knows but it does happen. I had a patient from Australia recently that literally had a shelf on her upper abdomen that she could place a coffee cup on. The picture on the left is the patient before Coolsculpting and the one on the right is 4 months after her Coolsculpting. Since she had the procedure at a medspa unsupervised, she went to see a local plastic surgeon who referred her to me for definitive management. I performed minimally invasive Vaser liposuction using a few special instruments I had made to help break down the scar and get a smooth result. The procedure was 60 minutes and here is her 2 weeks. Contact Neinstein Plastic Surgery today. Our expert team is ready to help you overcome Coolsculpting complications to help you reach the body you deserve.